Grapes: Nero d'Avola prevalente e piccole percentuali di altre varietà. Description: An exquisitely executed Nero d’Avola, this wine is deep ruby-red in colour. The enticing bouquet has a sweet fragrance with a fine balsamic undertone. 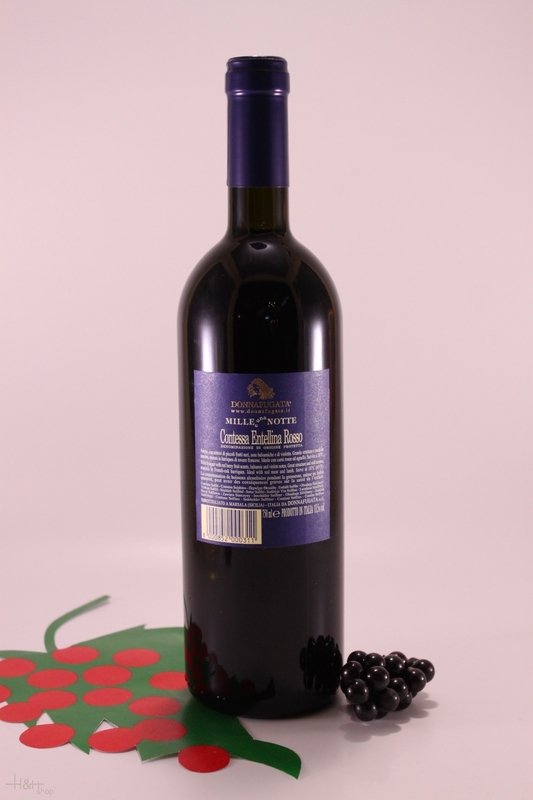 The palate opens with floral notes of violet and rounds out with hints of tobacco on the persistent finish. A wine with exceptional structure and remarkable personality. "Decanter World Wine Awards" has rated the wine "Donnafugata 'Mille e Una Notte' Contessa Entellina, Sicily, Italy" from the vintage 2012 on 01.01.2017 with 90 of 100 points. "Wine Spectator" has rated the wine "Donnafugata 'Mille e Una Notte' Contessa Entellina, Sicily, Italy" from the vintage 2011 on 30.04.2016 with 90 of 100 points. "Wine Enthusiast" has rated the wine "Donnafugata 'Mille e Una Notte' Contessa Entellina, Sicily, Italy" from the vintage 2011 on 03.01.2016 with 92 of 100 points. "Robert Parker The Wine Advocate" has rated the wine "Donnafugata 'Mille e Una Notte' Contessa Entellina, Sicily, Italy" from the vintage 2010 on 31.12.2015 with 95 of 100 points. "Luca Gardini" has rated the wine "Donnafugata 'Mille e Una Notte' Contessa Entellina, Sicily, Italy" from the vintage 2010 on 01.07.2015 with 89 of 100 points. "Wine Enthusiast" has rated the wine "Donnafugata 'Mille e Una Notte' Contessa Entellina, Sicily, Italy" from the vintage 2009 on 04.01.2015 with 91 of 100 points. "Wine Spectator" has rated the wine "Donnafugata 'Mille e Una Notte' Contessa Entellina, Sicily, Italy" from the vintage 2009 on 15.10.2014 with 90 of 100 points. "Vinum Wine Magazine" has rated the wine "Donnafugata 'Mille e Una Notte' Contessa Entellina, Sicily, Italy" from the vintage 2008 on 01.10.2014 with 17 of 20 points. "El Mundo Vino" has rated the wine "Donnafugata 'Mille e Una Notte' Contessa Entellina, Sicily, Italy" from the vintage 2008 on 01.09.2014 with 16 of 20 points. "Vinous Antonio Galloni" has rated the wine "Donnafugata 'Mille e Una Notte' Contessa Entellina, Sicily, Italy" from the vintage 2008 on 01.03.2014 with 93 of 100 points. "Wine Enthusiast" has rated the wine "Donnafugata 'Mille e Una Notte' Contessa Entellina, Sicily, Italy" from the vintage 2008 on 09.01.2014 with 91 of 100 points. "Wine & Spirits Magazine" has rated the wine "Donnafugata 'Mille e Una Notte' Contessa Entellina, Sicily, Italy" from the vintage 2007 on 01.06.2013 with 90 of 100 points. "Vinous Antonio Galloni" has rated the wine "Donnafugata 'Mille e Una Notte' Contessa Entellina, Sicily, Italy" from the vintage 2007 on 01.02.2013 with 92 of 100 points. "Vinum Wine Magazine" has rated the wine "Donnafugata 'Mille e Una Notte' Contessa Entellina, Sicily, Italy" from the vintage 2007 on 01.04.2012 with 17 of 20 points. "Wine Spectator" has rated the wine "Donnafugata 'Mille e Una Notte' Contessa Entellina, Sicily, Italy" from the vintage 2007 on 29.02.2012 with 90 of 100 points. "Wine Enthusiast" has rated the wine "Donnafugata 'Mille e Una Notte' Contessa Entellina, Sicily, Italy" from the vintage 2007 on 04.01.2012 with 93 of 100 points. "Falstaff Magazin" has rated the wine "Donnafugata 'Mille e Una Notte' Contessa Entellina, Sicily, Italy" from the vintage 2007 on 14.10.2011 with 94 of 100 points. "Wine Enthusiast" has rated the wine "Donnafugata 'Mille e Una Notte' Contessa Entellina, Sicily, Italy" from the vintage 2006 on 03.01.2011 with 93 of 100 points.